In 1996, two acts were passed to promote the welfare of building and construction workers. These acts mandated constitution of construction workers’ welfare boards at the state level and collection of 1% Cess on cost of construction. More than Rs 25000 crore rupees of cess collected in the last 20 years is still unspent. In the course of a hearing of the ongoing case in the Supreme Court (SC), in W.P. (Civil) No. 318/2006, the Comptroller and Auditor General (CAG) informed the court that the cess collected for the welfare of construction workers was being misused. The CAG informed the court that expenditure was shown for payment of entry tax / value added tax, for purchase of washing machines & laptops for construction workers etc. among other things. The Supreme Court while expressing its anguish over the manner in which the State & Central governments have failed to implement the act, issued specific directions for both governments. The Standing Committee on Labour also submitted a report in the previous session of Parliament about the workers’ welfare cess and their utilization. As per data published in this report, more than Rs 25000 crore cess collected in the last 20 years is still unspent and labour welfare sounds more like an empty talk. Government of India brought ‘The Building And Other Construction Workers Welfare Cess Act’ in 1996 to levy and collect 1% to 2% cess on the cost of construction incurred by builders to augment the resources of the Building and Other Construction Workers Welfare Boards. These boards are constituted in every state under the Building and Other Construction Workers Act of 1996. As noted by Factly earlier, these welfare boards are supposed to take up a variety of activities for the welfare of the workers. Though the act was passed in 1996, the actual implementation began in 2007. A total of 2.58 crore construction workers are registered across the country with these boards as of March 2017. According to the available state wise data, Uttar Pradesh with 32.14 lakh has the most number of registered workers followed by West Bengal with 28.81 lakh workers. Madhya Pradesh is third in the list with 26.53 lakh registered workers. Apart from these three states, Tamil Nadu, Odisha, Andhra Pradesh, Kerala, Rajasthan, Karnataka & Chhattisgarh have more than 10 lakh registered workers each. Another six states have more than 5 lakh but less than 10 lakh registered workers. Big states like Bihar, Gujarat, and Jharkhand have fewer numbers of workers registered with the respective boards. Fewer than 10000 workers are registered in the states of Goa, Nagaland & Meghalaya. The Secretary for Ministry of Labour & Employment, Government of India recently told the SC that the number of registered workers has increased to 2.8 crore. It is widely believed that the entire construction workforce is not registered with these boards because of lack of awareness and stringent conditions like age criteria, 90 days of work etc. The committee also noted that the primary work relating to registration of workers has not been given the desired priority by the Ministry and the welfare boards. 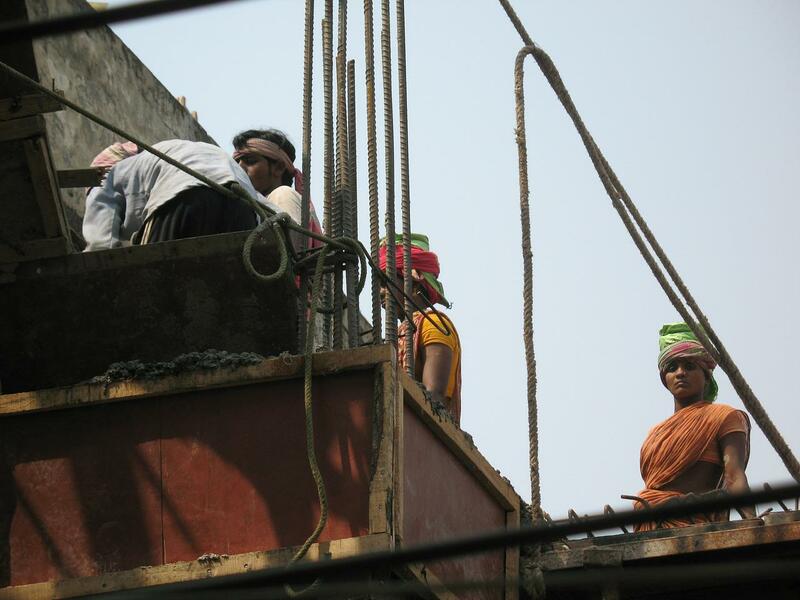 The Ministry of Labour representatives told the committee that there are around 4.6 crore construction workers. The committee noted that these estimates could be wrong and there could be many more construction workers since the construction activity across the country has picked up. To increase the number of registrations with the welfare boards, the committee has suggested multiple measures including giving registration powers to greater number of officers, visiting construction sites for registration of workers, wide publicity, online registration of workers etc. The State and the Local governments are supposed to collect the Cess and then transfer to these boards. The Ministry of Labour reported to the committee that a total of Rs 32,632.96 crore had been collected by the states during the last 20 years. The Committee felt that the amount of cess collected in the last 20 years does not match with the construction activities carried out. The committee further noted that the amount reported by the Ministry could be of the government organizations like the Railways/NHAI/PWD/CPWD alone. The committee also noted that there is no proper system of collection of cess and its transfer to the welfare boards. In some states, the welfare boards were constituted 7-8 years after the cess collection started. The committee asked the ministry to identify such states and seek the actual numbers related to the cess collection in the last 20 years. As per the data submitted by the government to the standing committee, only Rs 7516.52 crore has been spent by the welfare boards out of the total cess collection of Rs 32,632.96 crore. This is only 23% of the total cess collected. Only 6 states have spent more than half the cess collected. Kerala spent close to 99% of the cess collected, the only state to have spent more than 90%. The Secretary for Ministry of Labour & Employment, Government of India recently told the SC that the total cess collection has increased to Rs 37,482 crore and that the total utilization has increased to Rs 9,491 crore as of 30th June 2017. However, the detailed breakup of state wise collection & expenditure is not available. The data indicates that the states that collected the highest amount of cess spent the least on the welfare of the construction workers. Maharashtra collected a total of 5074 crore rupees, but spent just 5% of this amount on the welfare of workers. Similarly, Karnataka collected 3861 crore rupees, but spent just 6% of this amount. Uttar Pradesh (20%), Delhi (9%), Haryana (9%), Tamil Nadu (35%), Rajasthan (39%), Madhya Pradesh (35%) are next in the list. A total of 13 states collected more than 1000 crore rupees each. These 13 states collected more than 82% of the total cess collected in the country and together spent just 21% of the amount collected. Labour Welfare an empty talk? The committee noted that 5% of the total 23% expenditure was on administrative expenditure like salaries etc. The committee also noted that many state welfare boards have not submitted audited accounts to the state government. This indifference is seen across party lines and in various states. Gujarat that has been ruled by the BJP for close to two decades has spent only 2.2% of the cess collected. States like Maharashtra that have been ruled by the Congress till 2014 have fared no better. Of the bigger states, the only exception seems to be Kerala & West Bengal. The Central Government says it has been constantly reminding the State governments and State Welfare Boards to take steps to accelerate registration of construction workers, collection and utilization of cess. But despite all this talk, there is hardly any progress on ground. The SC had asked all the state governments to submit to the CAG, the details of cess collection, amount of cess transferred to the welfare boards and their utilization during. The CAG filed an affidavit in the court based on some preliminary findings that expenditure was shown as incurred for payment of entry tax / value added tax, for purchase of washing machines & laptops for construction workers etc. The court observed that the collected cess was being frittered away. While the Secretary for Ministry of Labour & Employment, Government of India assured the court that she will call a meeting of the Monitoring Committee consisting of the Labour Secretaries of all the States and Union Territories within a month to discuss all the issues, only time will tell if this will change anything on ground. Previous ArticleAs Supreme Court issues fresh guidelines, what about the Conviction rate of crimes against SCs/STs?